The Munster Heat began their Alan Murray T20 Cup campaign last Thursday with a win over Division 1 leaders Merrion. Following the walkover gained when North Kildare withdrew from the competition, the Heat finally got their campaign underay with a trip to leaders Merrion last Thursday evening. An undoubtedly difficult start for the Heat, making their debut in the competition, and providing more practice, and an opportunity for some of those on the fringes of the Munster Reds squad to put their hand up ahead of the festival weekend in July. An excellent performance in the field restricted Merrion to 130 for 8, with Irish U17 squad members Senan Jones (2-8) and Diarmuid Carey (4-17) leading the way. Arslan Anwar lead the way with 42, but there were scores throughout the top order, and having lost four wickets Murtaza Sidiqi ensured the win by hitting two sixes in the penultimate over for a huge shock to open their competition. Merrion 130-8 (P Mehta 56*; D Carey 4-17, R Jones 2-22, S Jones 2-8) lost to Munster Heat 131-4 (A Anwar 42, C Hassett 22, J Benton 23) by six wickets. The next assignment saw the side make the trip to Phoenix last Saturday to face the hosts and Clontarf. A dry dusty wicket favoured spinners all through the day and resulted in some very interesting and tight cricket. Again, a consistent bowling and fielding performance restricted Phoenix to 123 for 8 with the experienced Abubakar Saddique leading the way with 3-22, well supported by Mustafa Sidiqi who took 2-9. Again, the Heat batsmen contributed, but the pace of the innings was a little too slow against the Phoenix spinners, and this time the young side came up four runs short, closing on 120 for 6. Phoenix 123 for 8 (F Coutts 47; A Saddique 3-22, Mustafa Sidiqi 2-9, J Benton 1-16) beat the Munster Heat 120-6 (R Jones 25; G Millar 4-25) by four runs. The final game against Clontarf saw the pace of the game increase considerably. Based on a great inning of 83 by their professional AJ Pienaar, Clontarf set the very challenging total of 165 for 5. Spinner Saddique again excelling, taking 3-28 against a strong Clontarf batting order. This time Munster Heat kicked off at a great rate after an opening partnership of 48 between Cormac Hassett and Arslan Anwar. Ruadhán Jones , Jeremy Benton and Saddique kept the momentum going, and victory looked possible with just 16 required off the final three overs. At this point, Clontarf’s two Munster Reds squad members, David Delany and Robert Forrest, made a major impact. Delaney bowled two excellent overs taking 1-5 and restricting the Heat batsman trying to get over the line, while Forrest hit the stumps twice running out Shelford Meads and Mathew Brewster as they tried to take runs to the keeper. The result was an enthralling tie, with the Heat finishing on 165-8. Clontarf 165-5 (AJ Pienaar 83, A Poynter 40; A Saddique 3-28, S Jones 1-22) tied with Munster Heat 165-8 (R Jones 32, J Benton 32, A Anwar 30; S Dutt 2-42, D Delany 1-5). 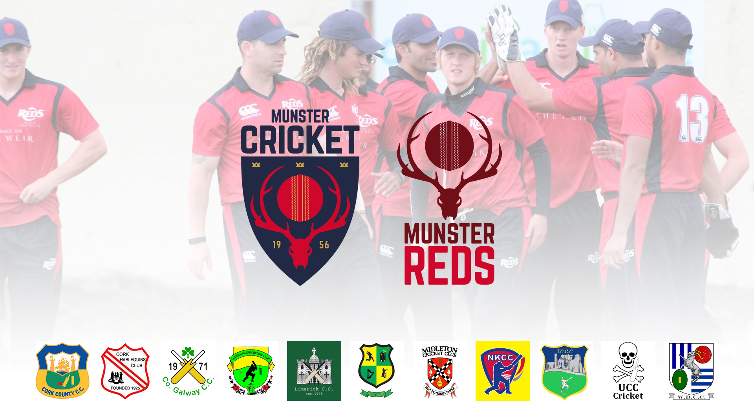 Munster Heat squad for the three games: Jeremy Benton (Captain, Cork County), Cormac Hassett, Diarmuid Carey, Shelford Meads (All Cork County), Ruadhán Jones, Senan Jones, Matthew Brewster, Adam Hickey (All Cork Harlequins), Arslan Anwar (Co Kerry), Murtaza Sidiqi ,Mustafa Sidiqi (Both Limerick). As Ted Williamson was away on holidays, thanks go to Chris Hickey, Kingsley Jones and David Griffin for managing the squad for these games. Munster Heat complete their Alan Murray Cup fixtures on Saturday 30th June in YMCA with fixtures against the host club and Terenure.